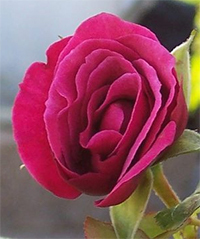 The miniature rose Camden was first bred in the United States by Robin Hough in 2002. It was introduced to market a few years later. This variety was created by crossing the Black Jade miniature rose with the Mollycita rose. 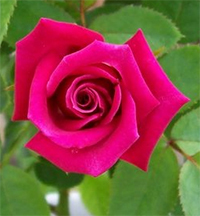 The result is a stunning red rose that tends to lean towards the more purple shades, giving it a burgundy appearance. Camden roses will grow only about 3 feet tall, which is still a little larger than one might expect from a miniature rose. The blooms will not disappoint however and they will usually be solitary blooms with an average diameter of around 2 inches. They will be somewhat full as each bloom will have as many as 25 petals. The rose Camden is pretty versatile throughout the garden and it is frequently grown as a border rose and in containers. Its mild fragrance makes it an excellent cut flower rose for arrangements as well. Growing the rose Camden is pretty easy and just about anyone can learn to grow it well. There are a few things you need to make you provide your roses if you want them to produce a lot of blooms. The first one is sun light. While there are some varieties of roses that can tolerate partial shade, just about all of them will do their best work if you give them a location that receives full sun. a good rule of thumb is to provide them with at least 6 to 8 hours each day of direct sun light. If you can offer them more, all the better. 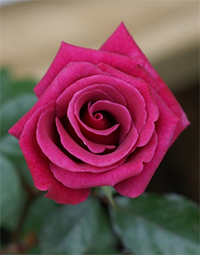 The soil requirements for Camden roses is the same as other roses also. You will want soil that drains well to prevent your rose from staying wet for long periods of time. This scenario could lead to an unhealthy plant and certain diseases and pests. If you are unsure how good your garden soil is, pick up a bag of a good organic compost from the local garden center. When you dig the hole to plant your rose, mix the compost in with the loose soil at a ratio of 1 part compost for every 2 parts soil. This is actually a great mix for most plants, but the rose Camden will absolutely love it also. How you go about planting the rose Camden depends a bit on how you purchased it. If you bought it from an online nursery then there's a good chance it was shipped to you as a bareroot plant. You should first soak the plant overnight in a bucket of lukewarm water. Then dig yourself a hole that is as wide as the longest roots, and deep enough to allow you to set the plant atop a mound of soil and still maintain a bud union depth of about an inch or two. If you bought your Camden roses locally, then there's a good chance they were already planted in containers and ready to go. Just dig yourself a hole that is twice the diameter of the container and equally as deep. In both the above cases, back fill the hole only about halfway to start and then water the loose soil heavily with the garden hose until the soil flows around the roots like mud. Then go ahead and back fill the rest of the way and give it one more heavy watering, being sure to top off any final settling that may have occurred. This method should ensure that no air pockets have formed around the roots of your rose Camden. Taking care of the rose Camden is pretty easy once you have it established. You will need to make sure that you provide it with adequate water while taking care not to over water it. If you are unsure, stick your finger into the soil to check the moisture level. If your finger comes out wet then chances are it does not need watered. A good rule of thumb for roses is one deep watering each week. Container roses tend to dry out quicker so pay special attention to those. You can give your Camden roses a dose of an all-purpose granular fertilizer in the early spring when the leaves start to open. 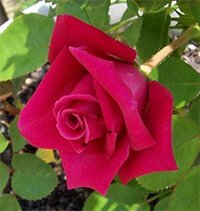 I have learned over the years to stay away from the liquid chemical fertilizers as they can too easily be misapplied and will burn certain varieties of roses. Since the rose Camden is a repeat bloomer, you may want to consider giving it additional feedings over the course of the growing season. I will usually give my roses a second feeding just after the first big bloom, and then a third feeding later on around midsummer to help encourage late season flushes. 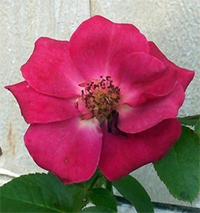 You should also prune the rose Camden in early spring before the leaves start to open. Begin by cutting out all the dead and discolored canes. Next, thin out any lateral canes that are crossing one another as these will eventually compete with one another for sun light once the leaves fully open. Lastly, cut back any remaining canes by about one third of their current height. This will encourage new growth. This is also the time that you should clean up around the base of your Camden roses and get rid of all the dead leaves and debris that has collected there from the previous growing season. Throw away all of this material in the trash along with your cuttings. Never allow this material to lay around the base of your roses because decaying matter can become a breeding ground for pests and diseases. You also do not want to throw any of these into the compost bin because certain spores have been known to survive the cold winter months only to re-infect your plants the following spring. You should finish up your pruning by giving your rose Camden a fresh layer of mulch to begin the new growing season.